Antique Jaipur pottery Rajput Mughal Glazed Rosewater Sprinkler 11"
Seller: peakxv (1,043) 100%, Location: Rothesay, Ships to: CA, US, Item: 132962547461 Antique Jaipur glazed pottery rosewater sprinkler . Measuring 11" in height decorated in floral vines in intense mineral derived blue hues on a white paste background. Small stone paste mark on one side. Mughal, Indian, influence - excellent Raj era piece for any and all pottery collections. Very good condition - see photos for actual condition. Expert, ,Safe, Well Padded Shipping provided to all destinations on the globe. Condition: In very good overall condition commensurate with age. stoneware paste bump on one side. See photos for actual condition. 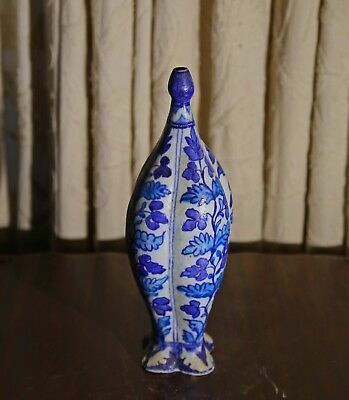 Antique Jaipur pottery Rajput Mughal Blue White Glazed Pottery Vase 19.5"